Panera Bread Company (NASDAQ: PNRA) today reported net income of $42 million, or $1.60 per diluted share, for fiscal Q2 2015. Diluted EPS for fiscal Q2 2015 was $1.61 or down 7%, excluding charges recorded in fiscal Q2 2015 related to the Company's previously announced refranchising initiative of $0.01 per diluted share, and excluding the $0.08 per diluted share benefit in fiscal Q2 2014 from a favorable resolution of an insurance coverage matter. The fiscal Q2 2015 results compare to reported net income of $49 million, or $1.82 per diluted share, for fiscal Q2 2014. A reconciliation of GAAP and non-GAAP information is attached to this release as Schedule V.
In fiscal Q2 2015, Company-owned comparable net bakery-cafe sales increased 2.4%, franchise-operated comparable net bakery-cafe sales increased 1.1%, and system-wide comparable net bakery-cafe sales increased 1.8% compared to the same period in fiscal 2014. The Company-owned comparable net bakery-cafe sales increase of 2.4% in fiscal Q2 2015 was comprised of year-over-year transaction growth of 1.1% and average check growth of 1.3%. A schedule of comparable net bakery-cafe sales information is attached to this release as Schedule III. Operating margin for fiscal Q2 2015 declined approximately 150 basis points versus fiscal Q2 2014, excluding charges related to the Company's refranchising initiative, as outlined in Schedule V. This decline was primarily the result of structural wage increases and costs related to our strategic initiatives, partially offset by lower general and administrative expenses reflecting the Company's previously announced initiative to reduce core general and administrative expenses in fiscal 2015. During fiscal Q2 2015, the Company opened 18 new bakery-cafes and its franchisees opened 12 new bakery-cafes. As a result, there were 1,926 bakery-cafes open system-wide as of June 30, 2015. Average weekly sales ("AWS") for Company-owned "Class of 2015" bakery-cafes through fiscal Q2 2015 was $44,967. AWS for franchise-operated "Class of 2015" bakery-cafes through fiscal Q2 2015 was $49,683. A schedule of fiscal Q2 2015 AWS, including AWS information for bakery-cafes based on their designation as either a traditional or non-traditional bakery-cafe, is attached to this release as Schedule II. Non-traditional bakery-cafes refers to a range of alternate formats that the Company believes will allow it to more deeply penetrate existing and new territories with a range of different formats. During fiscal Q2 2015, the Company repurchased 680,379 shares at an average price of $183.69 per share for an aggregate purchase price of approximately $125.0 million. The Company had approximately $533.4 million available under the $750 million repurchase authorization as of Q2 2015. On July 16, 2015, the Company secured a five-year, amortizing $300 million term loan. This term loan is incremental to the Company's $100 million term loan due June 11, 2019. To hedge exposure to variability in cash flows due to the impact of changes in interest rates, concurrent with the issuance of the $300 million term loan, the Company entered into forward-starting interest rate swaps with total initial notional value of $242.5 million. Considering the interest rate swaps, the combined effective rate of the term loans is expected to average approximately 3% over the life of the loans. The Company continues to make significant progress on its plan to refranchise 50 to 150 bakery-cafes. On July 14, 2015, the Company completed the sale of 29 bakery-cafes to an existing franchisee, bringing the year-to-date total to 30 bakery-cafes. The Company remains on track to reach its refranchising goal and expects to refranchise approximately 50 additional bakery-cafes by the end of fiscal Q3 2015. As of fiscal Q2 2015, the Company had completed the conversion of 183 bakery-cafes to Panera 2.0, with 77 conversions completed year-to-date. 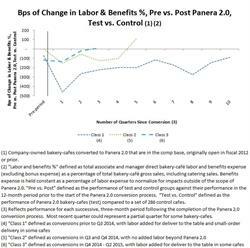 The Company is releasing supplemental information, attached to this release as Schedule IV, detailing the performance of Company-owned bakery-cafes converted to Panera 2.0. The Company announced today that Company-owned comparable net bakery-cafe sales in the first 27 days of fiscal Q3 2015 were up 4.7%. The Company today reiterated its full year fiscal 2015 diluted earnings per share growth target of flat to down mid- to high-single digits when compared to full year fiscal 2014, excluding charges in fiscal 2015 for the Company's refranchising initiative and certain items for full year fiscal 2014, as disclosed in our fiscal Q4 2014 earnings release. The Company reiterated its targeted range for fiscal 2015 Company-owned comparable net bakery-cafe sales growth of 2.0% to 3.5%. For fiscal 2015, the Company continues to expect operating margin will be down 100 to 175 basis points when compared to fiscal 2014, excluding the impact of charges related to the Company's refranchising initiative. The Company continues to expect 105 to 115 system-wide new bakery-cafe openings in fiscal 2015 and is reconfirming its average weekly net sales performance target for new Company-owned bakery-cafes of $43,000 to $45,000. The Company continues to expect the conversion of approximately 300 Company-owned bakery-cafes to Panera 2.0 during fiscal 2015. Ron Shaich, Chairman and CEO, commented, "Our strategic plan to generate increased shareholder value by making Panera a better competitive alternative with expanded growth opportunities is making a difference. Leading indicators are showing just that. Comp-store sales growth increased sequentially every month in Q2 2015 and reached 4.7% for the first 27 days of Q3. Panera 2.0, inclusive of digital access and improved operations, is working. Innovation in food, marketing and store design are having a positive impact on Panera's competitive position. Our initiatives to expand into several $1B+ adjacent businesses, including catering, delivery and CPG, are generating powerful sales growth and show increasing promise. However, the impact of the startup and ramp up costs associated with the hundreds of Panera 2.0 conversions expected in the third and fourth quarters of 2015 and the hundreds more expected in 2016, along with the dozens of delivery hubs opened in the past eighteen months, will dampen near-term profit growth. In our history, sales have led and profits have followed, and we believe that will again be the case at Panera. In fact, our leading indicators give us increased confidence in our strategic plan and in our potential to reignite significant earnings growth." The Company will host a conference call that will be broadcast on the Internet at 8:30 A.M. Eastern Time on Wednesday, July 29, 2015 to discuss the fiscal Q2 2015 results, preliminary comparable net bakery-cafe sales results for the first 27 days of fiscal Q3 2015, and earnings targets and business outlook for the full year fiscal 2015. To access the call or view a copy of this release, go to http://www.panerabread.com/investor. Access to the call will be made available for 14 days, and the release will be archived for one year. We're also focused on improving quality and convenience. With investments in technology and operations, we now offer new ways to enjoy your Panera favorites -- like mobile ordering and Rapid Pick-Up for to-go orders -- all designed to make things easier for our guests. As of June 30, 2015, there were 1,926 bakery-cafes in 46 states and in Ontario, Canada operating under the Panera Bread®, Saint Louis Bread Co.® or Paradise Bakery & Cafe® names. For more information, visit panerabread.com or find us on Twitter (@panerabread), Facebook (facebook.com/panerabread) or Instagram (@panerabread). Matters discussed in this news release and in our public disclosures, whether written or oral, relating to future events or our future performance, including any discussion, express or implied, regarding our intention to repurchase shares from time to time under the share repurchase program and the source of funding of such repurchases, our refranchising activities, our anticipated growth, operating results, plans, objectives, future earnings per share, and the impact of our investments in sales-building initiatives and operational capabilities on future sales and earnings, including Panera 2.0, contain forward-looking statements within the meaning of Section 27A of the Securities Act of 1933, as amended, and Section 21E of the Securities Exchange Act of 1934, as amended. These statements are often identified by the words "believe," "positioned," "estimate," "project," "target," "plan," "goal," "assumption," "continue," "intend," "expect," "future," "anticipate," and other similar expressions, whether in the negative or the affirmative, that are not statements of historical fact. These forward-looking statements are not guarantees of future performance and involve certain risks, uncertainties, and assumptions that are difficult to predict, and you should not place undue reliance on our forward-looking statements. Our actual results and timing of certain events could differ materially from those anticipated in these forward-looking statements as a result of certain factors, including, but not limited to, those discussed from time to time in our reports filed with the Securities and Exchange Commission, including our Annual Report on Form 10-K for the fiscal year ended December 30, 2014 and our quarterly reports on Form 10-Q. All forward-looking statements and the internal projections and beliefs upon which we base our expectations included in this release are made only as of the date of this release and may change. While we may elect to update forward-looking statements at some point in the future, we expressly disclaim any obligation to update any forward-looking statements, whether as a result of new information, future events, or otherwise. [a] Represents year-to-date system-wide AWS at the end of fiscal Q2 2015. [b] 2015 franchise-operated AWS excludes one refranchised bakery-cafe. [c] Represents year-to-date bakery-cafe openings and AWS for fiscal 2015 and fiscal 2014. Traditional bakery-cafes generally represent bakery-cafes opened in suburban geographies approximating our standard 4,200 square foot design. Non-traditional bakery-cafes reflect all other bakery-cafes including urban, small footprint formats, and delivery units. Because the non-traditional bakery-cafe designation covers various formats and the formats of non-traditional bakery-cafe openings may vary from period-to-period, comparing AWS for non-traditional bakery-cafes on a year-over-year basis may not be meaningful. [d] Bakery-cafe openings in fiscal Q2 2015 exclude the opening of one Company-owned delivery hub. As of fiscal Q2 2015, there were 29 Company-owned and one franchise-operated delivery hubs operating. Bakery-cafe openings in fiscal 2014 exclude the opening of 15 Company-owned and one franchise-operated delivery hubs. The schedule below and image linked above detail certain operating metrics for base Company-owned bakery-cafes converted to the Panera 2.0 format as of June 30, 2015. Panera 2.0 is our strategic initiative designed to enhance the customer experience that is enabled by technology and operational improvements. The operating metrics presented in this schedule, as defined in the footnotes below, reflect certain components of the items presented in the Company's consolidated statements of comprehensive income, included in this release as Schedule I. (1) Reflects performance for each successive, three month period following the completion of the Panera 2.0 conversion process. Most recent quarter could represent a partial quarter for some bakery-cafes. 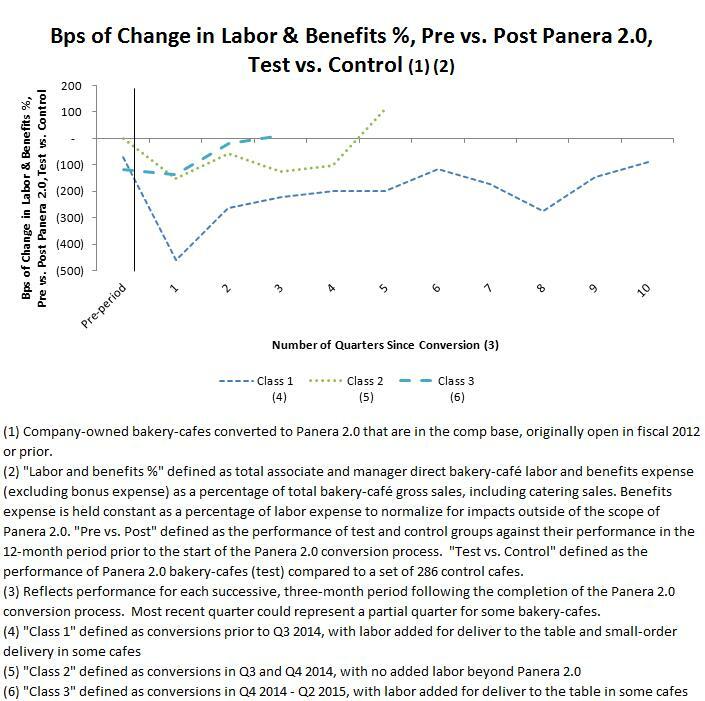 (2) Company-owned bakery-cafes converted to Panera 2.0 that are in the comp base, originally open in fiscal 2012 or prior. (3) "Cumulative gross retail sales increase" defined as the cumulative percentage increase in the retail gross sales compared to the same period in the fiscal year prior to the completion of the Panera 2.0 conversion. Retail gross sales excludes catering sales. The Company uses diluted earnings per share excluding certain items as a key performance measure of results of operations for purposes of evaluating performance internally. This non-GAAP measurement is not intended to replace the presentation of our financial results in accordance with GAAP. Rather, the Company believes that the presentation of results excluding certain items provides additional information to investors to facilitate the comparison of past and present operations, excluding items described below that the Company does not believe were indicative of our ongoing operations in the 13 and 26 weeks ended June 30, 2015 and July 1, 2014, respectively. (1) Refranchising losses of $0.7 million and $9.6 million before net effective tax benefits of $0.3 million and $3.6 million recorded during the thirteen and twenty-six weeks ended June 30, 2015, respectively. (2) Benefit from a favorable resolution of an insurance coverage matter of $3.2 million before the effective tax rate recorded during the thirteen weeks ended July 1, 2014.